This year, our in-house dietitian Mary Alice Shreve has developed a series of SuperFood recipes with our Culinary Director, Chef Seth Freedman. Each dish in the series is packed with powerhouse, superfood ingredients. Think wheat berries, pepitas, kale, edamame, and more. It’s PeachDish deliciousness with even more nutritional punch to start your year off feeling great. Start getting inspired for 2016 with our resident RD Mary Alice! Mary Alice: I'm a huge science nerd and have enjoyed cooking since I was a little girl. I wanted to find a career where I could marry the two, and dietetics offered just that! We all have a story to share when it comes to food. I enjoy working in a field that celebrates those stories. What do you love about cooking at home? Mary Alice: Cooking is therapeutic—it allows you to carve out time to learn, focus, meditate, think out loud, laugh at yourself and have fun. The best part, in my mind, is taking pride in the work you've accomplished (and then devouring it). 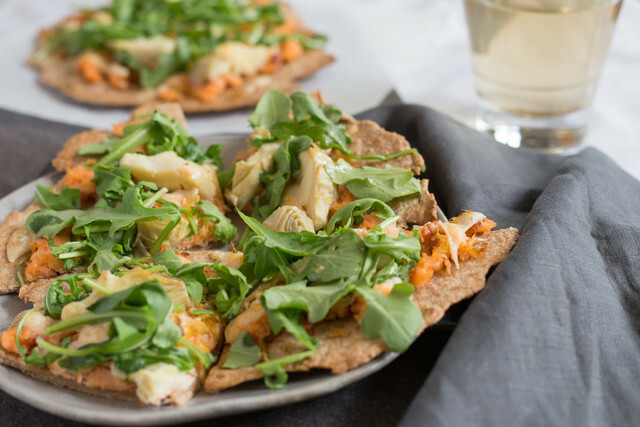 What are some of your favorite recipes you've worked on with PeachDish in 2015? Mary Alice: I've greatly enjoyed my time collaborating with Chef Seth Freedman on our upcoming SuperFood Series—we've made a good team, balancing his vast chef knowledge with my dietitian advice. Despite my role as an RD, my sweet tooth tops the charts. So, I have to own that our upcoming Valentine's Date Night Meal-Kit dessert recipe has been my favorite to date...stay tuned!! Looking ahead to 2016, can you tell us about the January "SuperFood" series PeachDish will be offering? Mary Alice: The SuperFood Series will be available the first week of 2016 through February. The SuperFood Salad, incorporating 8+ different superfood ingredients, will be available on the menu throughout the series. Plus, each week, we’ll feature a different menu option highlighting a variety of superfoods. So, you can order two superfood-centric meals per week should you choose! It’s a great option for those committed to health in 2016. Mary Alice: A superfood is an ingredient packed to the brim with nutritional benefits, offering you the best bang for your healthy buck. Can you tell us about some of the nutritional benefits of ingredients being featured in the SuperFood series? Mary Alice: Our SuperFood Salad is the queen of the series and features a laundry list of nutritional benefits! 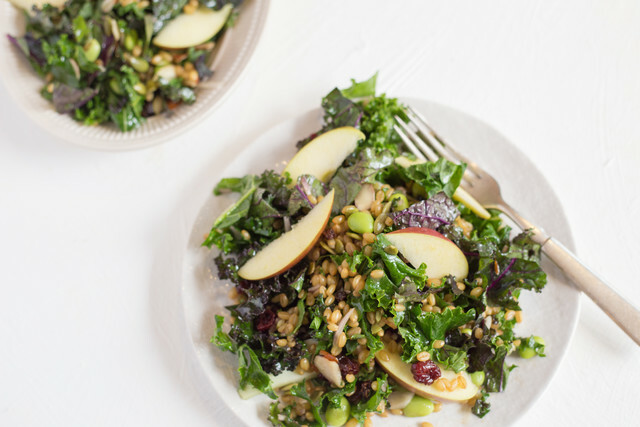 Wheat berries add lots of fiber and protein to make this a hearty, filling salad. 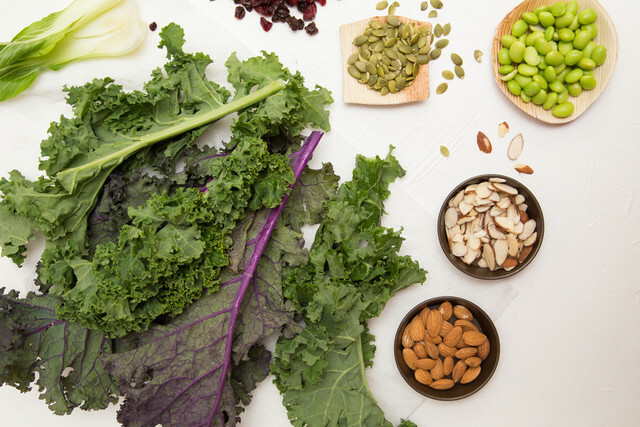 The edamame—one of my faves—is high in folate while kale—one of the more obvious superfoods—is high in Vitamins A, C, and K. Almonds, pumpkin seeds and olive oil contribute healthy unsaturated fats, and the dried dark berries and pomegranate juice are high in antioxidants. What's one of your favorite kitchen/cooking tips? Mary Alice: Honestly, I had never cooked with the stems of leafy greens (like kale stems) until I started working for PeachDish. Now, I love the added flavor (and nutrition!) that comes from chopping them up and sautéing them as part of your dish.